How do migrant crises in Europe intersect with BC’s referendum on electoral reform? Bill Tieleman, a member of the official opponent group in BC’s referendum, is rubbing his hands with glee at the result in Sweden’s recent election. He’s been posting and tweeting everywhere that the result was caused by a proportional voting system gets us. Of course, the migrant/refugee crises in Europe has nothing to do with their voting systems and everything to do with crises in the Middle East and Africa. Those crises will only be exacerbated as climate change starts adding millions more refugees to the flood. Canada is following in the footsteps of those countries who are ‘strengthening’ their borders because it’s expedient and appeals to voters, rather than acknowledging that more and more migrants will be on the move in the future. Read more. This article has a fine rebut to the fringe party argument fostered by the likes of Bill Tieleman. The root cause of the emergence of fringe parties is economic depression as well as immigrant fear-mongering. 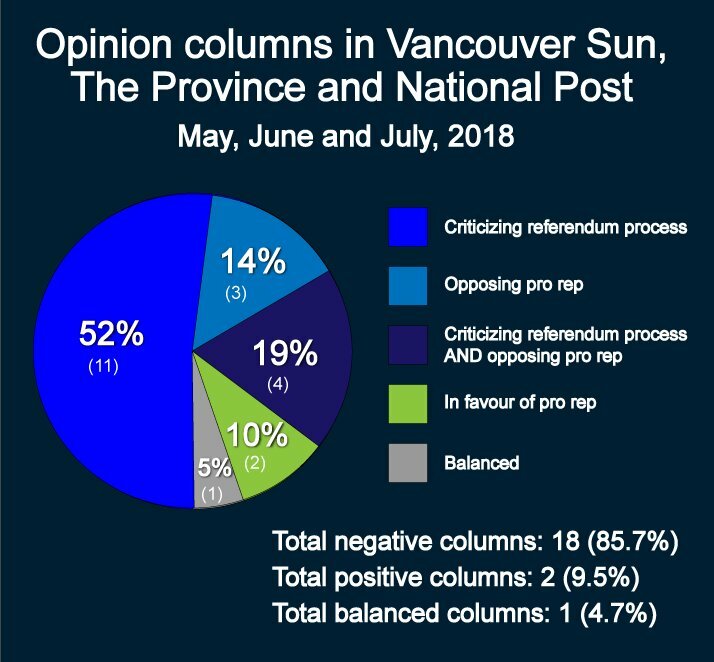 As noted in the article, all of BC’s proposed PR systems require that a party must receive 5% of the vote province-wide in order to gain seats in the Legislative Assembly, thus ensuring the unlikely rise of fringe parties. Guy Dauncey has written an interesting piece on the steps that actually comprise democracy. The article is interesting – and useful – on two levels. It talks about (and shows sample ballots for) the three systems that are on BC’s referendum this fall. But it also itemizes steps (or factors) that define a voting system as democratic. In this regard, he compares BC system to the US system, which is an interesting intellectual exercise. Wealthy elites are funding the opposition to BC’s electoral reform referendum, filings show. See the article for a list of donors. Read more. Corporate capture is a big theme for this blog. In this instance, it’s revealing to see how our major sources of news portray the referendum. The City of Courtenay is inviting the public to provide input on the vision, goals and future of Courtenay’s urban forest. The consultation will end soon and they haven’t gotten very much input. Please take a few minutes to give the City some feedback. The online survey will run all summer 2018. My Sea to Sky has created a letter to all municipal governments to demand that they hold fossil fuel companies accountable for climate change. This site has background and talking points if you want to write a personal letter, or they provide a ready-made letter for you to send to your local council. After you’ve filled in the form online, you’ll get an email confirming your letter and showing the councillors to whom your letter went. Click here for more information on why the UBCM (and individual local governments) should send climate accountability letters. Read more. Freshwater Alliance and supporters sent hundreds of letters to BC local city councillors to vote YES for the UBCM Watershed Governance Resolution. On Tuesday afternoon at UBCM in Whistler, the Watershed Governance Resolution passed! (High Five!) Because of water champions, we have taken a big step towards ensuring a model for watershed governance that supports community water needs and recognizes Indigenous rights, in a spirit of collaboration and resource-sharing. With support and resources from the Province of BC, the new Watershed Governance Model Resolution will help to ensure the success of the Water Sustainability Act, by empowering local decision-makers to work to prevent or mitigate water-related impacts and challenges in our communities. If you still have questions about what this all means for your community and B.C. check out this Blog post and celebrate this win by sharing the news with your friends! “Today we reaffirm our commitment to working together with @UBCM toward reconciliation with Indigenous peoples in British Columbia, including implementing the UN Declaration on the Rights of Indigenous Peoples & the Truth and Reconciliation Commission’s Calls to Action. #UBCM2018” So, why is it we still have Site C? The Native Sons Hall rocked on Thursday, September 13, when Kevin Taft spoke to an attentive crowd of around 115 about how oil corporations are corrupting what Abraham Lincoln defined as democracy: Government of the people, by the people, and for the people. This was the last stop on the successful Kevin Taft Tour in BC. Taft was introduced by Damien Gillis, Campbell River filmmaker, who graphically described the reach of oil companies into Canada’s public and private organizations as invasive and parasitic. Taft explored big oil’s tentacles further by specifically describing how every Canadian political party and its leader and ministers, every Canadian government department, every branch of the Canadian civil service, portions of every Canadian university and college, many private sector organizations, and even much of the Canadian press are infiltrated by oil corporations with the sole focus to control any and all discussion about oil and, ultimately, action on global warming. Attendees asked more questions than there was time to answer. Taft ended the evening by signing his critically received fifth book, Oil’s Deep State, of which many copies were sold. Kevin was on Steven Quinn’s Early Edition on CBC at 1:41 minutes into the show. He was also Mark Brennae’s guest on C-FAX 1070 radio in Victoria on Monday. Registration is required, though tickets are free. The evening will begin with an introduction to the United Nations Sustainable Development Goals, followed with an overview of the goals outlined in the Regional Growth Strategy and Official Community Plans and why these matter to the well-being of our Comox Valley communities. Five speakers will present information on a range of issues ranging from public health and local economic development to climate change and infrastructure. The Forum will address what is currently taking place in the Valley and how we can strengthen our commitment to build a more sustainable community. Read more. 470 Island Hwy. at 5th Ave. This exhibit is still showing at the Comox Valley Art Gallery in Courtenay. It will be there until October 4, 2018. Part 1: It’s contagious: Another rainbow crosswalk in BC has been vandalized. The LGBTQ2+ community in Golden is facing online backlash after posting information about the extent of vandalism as reported in these articles: Crosswalk vandalism leaves black mark for Cowichan as B.C. Games begin and White Rock’s rainbow crosswalk vandalized and Courtenay’s new rainbow crosswalk vandalized 1 day after completion and B.C. city’s new rainbow crosswalk vandalized after one week. Part 2: …and in the Comox Valley Record, there’s a letter to the editor whose author manages to reinterpret the rainbow crosswalk into Biblical terms. Editorial comment: NIPR Greens had a tent at the Comox Valley Pride Picnic in the Park this year. Greens all across Canada are very supportive of the LGBTQ2+ community and this needs to be ramped up. It seems that women and the LGBTQ2+ community are two groups about whom it is still acceptable to make derogatory comments. Sexist jokes, fag, and dyke jokes are still all too commonplace, no matter how tone-deaf. In the September 1 edition of Must Reads, we told you about the Scott Islands Marine National Wildlife Area. Well, Shell Canada gave up its offshore exploration rights to 50,000 square kilometres along the B.C. coast. Shell Canada’s rights covered an area more than one-and-a-half times the size of Vancouver Island, which is hard to value, said president Michael Crothers at a news conference on Thursday. “I hope we get some goodwill [in return],” said president, Michael Crothers. Read more. The graphic is very blurry, but the areas in red are areas where Shell had permits. “Lesson number one: if citizens don’t trust laws and regulatory processes, expect more determined resistance. Part 2: CBC’s coverage of the Trans Mountain Expansion controversy was, shall we say, limp at best and impotent at worst. So it’s nice to see them report that a study now shows bitumen can be deadly to young salmon. But even so, the CBC includes this paragraph: “The Canadian Association of Petroleum Producers [CAPP] did not comment on the research, but in a statement it said it is part of a separate and ongoing independent study to “provide a better understanding of the behaviour of oil in the unlikely event of a spill on water.” If you’ve read Kevin Taft’s book, Oil’s Deep State, then you’ve already learned how CAPP was part of the complete capture of our federal and Alberta governments so that all the policies go in the direction of the fossil fuel industry. Shame on CBC! Part 3: Update on Trans Mountain construction activities, post the court decision. Part 4: Continuing the theme of corporate capture, “instead of change, Alberta’s first NDP premier brought the same old kowtowing to big oil.” Read more. Part 5: Forty-two Order of Canada recipients are urging the federal government to cancel the Trans Mountain pipeline expansion and instead focus on the transition to a clean energy economy. Read more. Esther Shalev-Gerz is an installation artist who divides her time between Paris and Cortes Island. In the video below, we meet her near her studio overlooking a rugged cove on Cortes Island, British Columbia. On a walk through the forest, she takes us to the fallen giant that affirms the timeliness of her monumental new work, which will be inaugurated this week at a public event at UBC. Watch part of her conversation with Linda Solomon Wood, Editor in Chief of the National Observer, and read the story here. Continuing the theme of corporate capture and taking back our democracy, 350.org Canada has a youth initiative that is pretty exciting. Share this with any young Canadian you know. Excerpt: “The RISE 2019 convergence will take place in Ottawa, on the land of the Algonquin, Haudenosaunee, Huron-Wendat, and Anishinabek. It will bring together hundreds of young people from coast to coast to coast to participate in workshops, presentations, and skill building, and to hear inspirational keynotes, and absorb powerful art and entertainment. September 28-30, 2018. Read more. Convention 2018 is in Vancouver! Join us and help us build for success in 2019. Check out the list of speakers so far. An outline of the Convention schedule is now available on the GPC website Info and registration here. Canada’s auditors general have been examining government responses to climate change and is the first time that nearly all legislative audit offices in Canada have coordinated their work in this way. In March 2018, they published their findings. “The purpose of this summary report is to provide a snapshot of key issues that are common across governments; and highlight findings and examples of climate change action from the federal, provincial, and territorial audit work.” Not surprisingly, all the governments fell short of their commitments and stated objectives. Only New Brunswick and Nova Scotia were on track. This report makes for interesting reading. It always comes back to government inaction. Why is it that our governments refuse to act? Have you read Kevin Taft’s book, Oil’s Deep State? If you attended the Kevin Taft Tour event in Courtenay on Thursday, September 13, you will not be surprised by the information in this article which details some of parasitic oil corporation tentacles that have infiltrated Canadian politics and are quite apparent at the National Energy Board (NEB) a supposedly independent regulatory board set up by the government of Canada. The firm’s vice president of operations, Travis Moran, is a former US Justice Department special agent. Recently he opined, “Environmental activism is threatening your [oil corporations’] operations, it’s threatening your finances, it’s threatening your reputation, and it’s threatening your viability.” Read more. This coming Monday when Parliament resumes, the Liberals plan to make passing the TPP into law a top priority – despite the troubling lack of Parliamentary debate and public consultation. The Council of Canadians has built a new online tool you can use to send a message directly to your Member of Parliament and the Parliamentary trade committee members – calling for a full debate on the TPP. Will you send yours now? This article in the Tyee is also referenced in the section above on BC’s referendum. Its content is relevant to both the referendum in BC and Canada’s next election in 2019. The issue of “irregular migration” is already becoming divisive and the Liberals are moving rightwards into space vacated by the Conservatives, who have moved even further right. As global warming creates more climate “irregular migrants,” Canada will have floods of people coming across our borders. This week, over 1 million Carolinians were ordered to evacuate coastal areas because of Hurricane Florence. That’s only one state. How many millions of people in the US live within range of the forecasted sea level rise? Our governments need to be preparing for irregular migration associated with global warming. Excerpt: “Canada’s 2019 federal election campaign will coincide with dates for ending Temporary Protected Status for hundreds of thousands of migrants in the United States. While some might choose to come here, the more troubling option is that Donald Trump could send them our way. And read this article on a New England National Park where climate change mitigation was also removed from the planning process. Did you think Teen Vogue was only for teenage girls? If it is, then I’d say the world may be in good hands going forward. So it’s not only Canada’s First Nations who have filed suit against the federal government when it approved the twinning of the Trans Mountain pipeline. Now First Nations in the USA are suing the US State Department, which approved Keystone XL pipeline at Donald Trump’s urging. The pipeline passes through the ancestral homelands of the Rosebud Sioux in central South Dakota and the Fort Belknap tribes in Montana. The tribes say the pipeline was approved without fully considering its potential damage to their cultural sites. (See the article immediately below on protecting Indigenous cultural heritage.) Read more. “Development projects are claiming ancestral sites at alarming rates. This ineffective protection of Indigenous heritage is a violation of human rights, while the continued destruction of ancient sites, burial grounds and sacred places can be considered a form of violence.” In Canada, ‘heritage’ is mostly under the jurisdiction of provinces, but the well-being of Indigenous populations is mostly a federal mandate. So at its most basic level, provincial protection and preservation of Indigenous heritage is disconnected from the federal mandate. Read more. Excerpt: “Her campaign was one of the most beautiful experiences in the city’s political history. It involved black women, feminists, young people and residents of the favelas. She received the fifth most votes and the second most in her party. Marielle was unique in the way that she stood up not just for minorities, but for everyone. She succeeded in taking a human rights movement into parliament at a time when the Brazilian population had lost its faith in institutional politics. It was the start of a transformative process.” Read more. “The hardest idea to get across is also the simplest: we live on a planet, and that planet is breaking. Poets, it turns out, can deliver that message… It’s not, of course, as if global warming is some mysterious, uncontrollable force: it comes from a particular way of life, a way of life which has left some people rich and an increasing number in desperate straits. These poets can’t avoid the politics: their stanzas indict the civilisations which – long before we worried about climate change – blew up Bikini Atoll in the Marshalls and polluted Greenland’s ice sheet with nuclear waste.” Read the article here. “Democracy is showing greater strain than at any time in decades. That is why this International Day should make us look for ways to invigorate democracy and seek answers for the systemic challenges it faces.” (UN Secretary-General, António Guterres) Read more. Are you despairing over how to get rid of plastics? Well, a Dutch cycle path is made entirely of recycled bottles, cups and packaging. Read more.